Things or objects will be interconnected for communicating so that different computations can be performed. By making IoT work in real time, we can expect more efficient systems and increased automated operations, coming into existence. Will old Techniques work with same effectiveness? Cloud and IoT, collectively, will increase the necessity of software testing and quality assurance. Huge data, different communication protocols, resources, and technological growth will demand newer or advanced QA techniques. 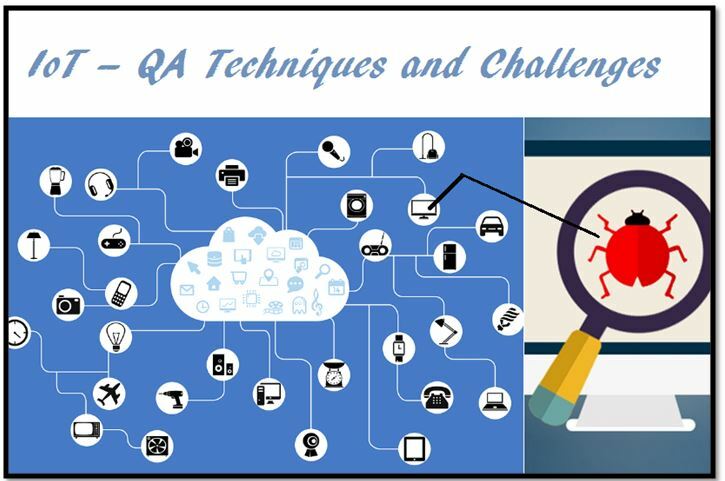 However, many traditional QA Techniques remain viable for basic IoT Testing. But the techniques, working in complete isolation for offline systems will probably disappear. Connectivity is the key element of IoT for establishing communication between objects. The architecture or model of the connected network in IoT applications needs quality assurance for robustness and execution of automated tasks. Web applications, embedded systems, back-end computing, and all the digital devices need proper development, testing before the deployment. IoT will be combining all these things. Beyond the pre-defined procedures, all applications and interfaces are tested from user’s perspective to understand the working of developed systems. Checking vulnerabilities, looking for weak points to enter the system and searching for bugs comes under quality assurance. The speed of network in varying traffic and performance of communication network model are some aspects for which quality is assured through the performance testing. It also ensures if the internal computational capabilities of an embedded system are performance-driven or not. Covering the issues like the privacy of users, safety from hackers, autonomy, spoofing, spying, etc. security testing will always remain an important part of quality assurance when systems are communicating. For checking the capability of an application to work properly on different operating systems, devices, configurations, protocols, products and multiple versions – compatibility tests are carried out on hardware and software entities. Countless objects, namely devices, sensors, systems and other things are collectively forming an IoT network. To maintain data privacy is crucial and difficult is such case circumstances. Better standards for the quality checkups are, therefore, required. Complex structures of appliances, machines, applications and other products reduce the ease of integration. Working simultaneously with other devices, with the expected functional excellence, is challenging due to greater variations. Quality Assurance for IoT is a challenging task but essential in all the ways. So, there will be daily new advancements, arriving in the technological world, to handle its problems and issues.